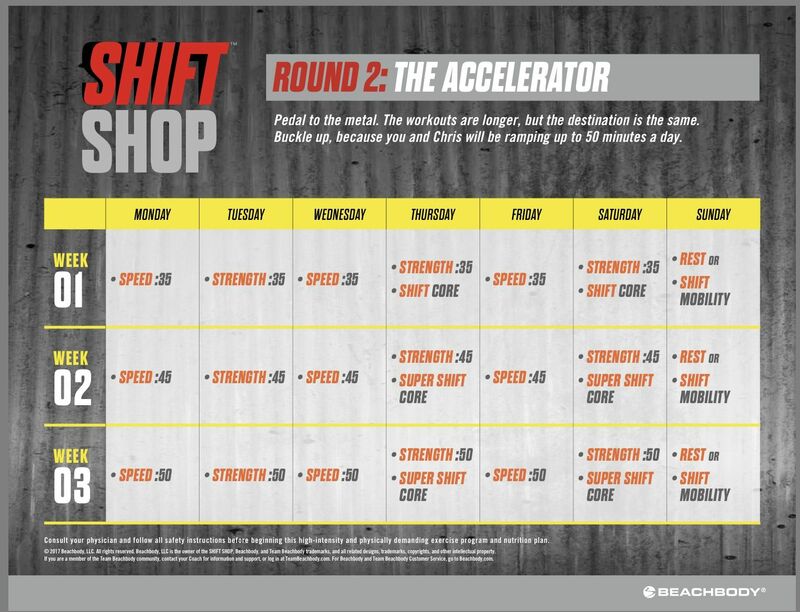 Beachbody’s Shift Shop workout program brings max results in 3 weeks! The new agility and strength workout promises your motivation, mindset, and body will be transformed no matter where you are starting from. We’ll look at the workouts, meal plan, calendar, and the results real people got with Shift Shop below. It’s also with the super trainer, Chris Downing who is so inspiring. You guys will love this at home program! The new Beachbody workout is designed to help your weight loss and fitness level, along with your confidence and mindset. While it’s a 3-week program, you can always do more rounds of it just like the 21 Day Fix, Core de Force, and other shorter calendar programs. The 3 week of workouts, build on each other and up the intensity each week. Yes! It is available to stream now! If you already have a membership, you should automatically see it when you log in. If you’re new to streaming your workouts, you can learn more about Beachbody on Demand here. Each week you’ll have 2 new workouts while mixing in a mobility and core workout. The meal plan also changes. It’s set up to help you get max results in 3 weeks! The workouts are a challenge 25 minutes to challenge your current fitness level. The meals this week are focused on a balanced amount of complex carbohydrates, lean protein, and healthy fat. Your carbs are about 40% of your daily intake. As you get stronger, the workouts go up to 35 minutes. The intensity also gets upped this week, and you are working on your endurance both cardio and strength wise. Meal wise you’ll be cutting out starchy carbs like bread and white potatoes and swapping them for vegetables and lean protein. In week 3, the workouts go up to 45 minutes, and the meal plan gets a little more strict and sort of Paleo. You are still getting about 30% of your daily diet from carbohydrates though so that you can fuel through your workouts. You also receive a Round 2 and Hybrid Calendar when you order. Is there a modifier in Shift Shop? Yes! There is a low-impact modifier in every workout. She is super motivating, and she’s still working towards her goal weight which I love! Speed: 25 25:00 Torch calories with 1-minute intervals for a total body workout. Strength: 25 25:00 Tone it up with 1-minute intervals of resistance movements. Speed: 35 35:00 ITake your cardio to the next level with moves to improve agility and stamina. Strength: 35 35:00 2-part foundational moves that help you get stronger. Speed: 45 45:00 Dynamic drills to ramp up your cardio conditioning. Strength: 45 45:00 Ultimate strength workout to tone it up and see definition. Shift Core 12:00 9, 1-minute ab and core moves. Shift Mobility 20:00 20 minute recovery workout. Super Speed: 50 50:00 Using a sandbag, you’ll do 3 rounds drills guaranteed to improve your endurance. Super Strength: 50 50:00 3 rounds of strength intervals designed to challenge you physically and mentally. Super Shift Core 15:00 Using a sandbag, you’ll go through 9 intense 1-minute ab exercises. You’ll need: Agility Markers and Weights for the normal workouts and a Sandbag or weights for Deluxe Workouts. Some have asked which program is better? We put together a guide to help you decide between the workouts. Check out our comparison Shift Shop vs 21 Day Fix here. You can also see how Shift Shop stacks up with Insanity and Insanity Max 30. It’s organized and includes high-quality workouts and a cutting-edge nutrition plan. Unlike other at home workout companies, Beachbody always has offers a high-quality workout. Chris is a known trainer with athletes, and I have no doubt one class with him would be more than this whole program. The video quality – whether you decide to stream or get it on DVD – is also top notch. Shift Shop isn’t just about losing weight or getting toned. Chris Downing really wants to make sure you feel strong inside and out – whether it be a workout, emotional eating or a problem you’re facing. During the workouts, he is cheering you on and giving you the strength in motivation to keep going. The meal plan is something that is doable long-term. It’s similar to a paleo approach. While you’ll be working at a calorie deficit to lose weight, you’ll be learning about the proper nutrition you need to fuel your body. It’s not a low-carb or Keto diet – both of which are hard to follow for a long period of time. In our opinion, the Shift Shop meal plan mixes all of the new information we know about nutrition with a realistic approach. You’ll see results and still get your favorite foods in moderation. What Do You Get With Shift Shop? You can choose to stream the workouts or have them on DVD now! Yes, if you already have Beachbody on Demand it’s on there automatically. You can now stream all of the workouts and download the meal plan and calendar. If you’re interested in streaming your workouts, check out our Beachbody on Demand review. Before becoming a Beachbody super trainer, Chris Downing was an elite fitness professional. His passion for fitness started as a high school and college basketball player. However, it wasn’t until his uncle, who was his father figure, died of a heart attack that he became a trainer. His first client, Tammy, was 680lbs and her several hundred pound weight loss only made him want to help people more. He opened up a gym in a football town. From there he began training organized sports teams and pro athletes. So he literally has experience from with all different levels of fitness. Also, from what we know right now – this looks like a great program for someone that loves a Shaun T workout but needs something more intermediate than Insanity Max 30. The Shift Shop Before and Afters were so awesome! This program is just 3 weeks! For MAX Shift Shop Results, you may consider looking into Shakeology and the Beachbody Performance supplements before and after your workouts. Stream Shift Shop Free for 2 Weeks on Demand After two weeks, if you love streaming and don’t cancel, the membership is $39 per quarter. When you check out, you should see me as your coach. If not, you can update it with the ID in the picture. Will you try Shift Shop? Do you stream with Beachbody on Demand? Have you looked into being a Beachbody coach yet? You could save 25% on your orders and grow a business like we did! Get more details here. I just want to order the Shift Shop workout DVD only without the Shakeology, containers and the Shakeology Shaker. How much will it cost. Thanks for your comment!! I apologize for the confusion on pricing – It’s $59.95 for the base kit. That’s the cheapest one they have and includes the workouts and meal plan. Does that sound good? They won’t release the base kit until 4pm PST time today, but I can send you a link then if you’d like. Do you have anything else you have questions on?